In this volume, Alok K. Kanungo and Robert H. Brill analyze some of the pieces found at the site of India's first glassmaking operation, in Kopia. The efforts are adding to our understanding of early Indian glassmaking. Also, Susan H. Myers offers a look at glass from the 1920s and 1930s in the Smithsonian Institution, and Diane C. Wright discusses Frederick Wilson, one of America's most prolific designers of ecclesiastical stained glass in the late 19th and early 20th centuries. Kopia, which was long considered to have been a center for glass manufacturing, was excavated by Alok K. Kanungo from 2004 to 2006 in order to learn more about the history, development, and technology of glass production in India—and especially to establish some framework for dating the evolution of that production. Twenty accelerator mass spectrometry (AMS) and radiocarbon dates, processed independently by three laboratories, were obtained. The dates range from 656 ± 134 B.C. to A.D. 153 ± 96 (calibrated) in one locality and to 2100 ± 90 B.P. (uncalibrated) in another locality. Chemical analyses of representative finds place them among glasses found—and probably made—in India. Strontium isotope analyses are consistent with the hypothesis that they were made in India. Reh and riverine sands are suggested as probable batch materials to account for the compositions. This article offers a reinterpretation of archaic glassmaking in the Hellenic and broader eastern Mediterranean area based on an extraordinarily rare find. It concerns an important group of five intact core-formed glass vessels (one monochrome and four polychrome), securely dated to the late sixth century B.C., from a burial at Daphne in Ialysos, Rhodes. These finds provide further evidence of the activity of the glassmaking workshop on Rhodes during the archaic period. The early phase of this activity can be dated to the mid-sixth century B.C. The secure terminus post quem is related to a shift from cremation burials to inhumations, as is reflected by the burial excavated at Daphne. About 80 pieces of scratch-engraved glass were found at Kom el-Dikka (Alexandria) during the excavation of a large Muslim cemetery. Most of them came from well-stratified burial levels and were attributed to the ninth and 10th centuries. As far as the form is concerned, the fragments fall into three groups: cylindrical cups, plates and bowls, and bottles. They form a fairly coherent group, in which geometric designs outnumber floral motifs, usually arranged in bands. The repertory of motifs consists of combinations of different lines and shapes. These elements are filled with short parallel lines. Most of the vessels are made of various shades of blue glass. Their stylistic and technical homogeneity may justify the conclusion that they are not only Egyptian but also of Alexandrian provenance. This archaeological, historical, and scientific study of decorated and undecorated glass bangles places them in an international context. The scientific analysis of the bangles has revealed an unexpectedly wide range of glass compositions. The chemical compositions, especially of the deeply colored (“black”) examples, present a signature that is not characteristic of the Middle East. This suggests that part of the glass was made in India, Africa, or the Far East, and that it reached Jordan along the Silk Road. The scientific analyses of these glasses also suggest that two kinds of raw glass were mixed. The bangles/glasses were evidently derived from a range of sources. The author describes a Venetian glass dish in The British Museum that has, at its center, the enameled arms of Fabrizio Del Carretto, grand master of the Knights of the Order of St. John on Rhodes from 1513 to 1521. In addition to its close dating, the dish is unusual because it bears the arms of a second member of the Knights of St. John, Fra Muzio Costanzo of Naples. This suggests that the dish may have been part of a set of luxury dining wares given by Costanzo to the grand master and made between 1513 and 1521. 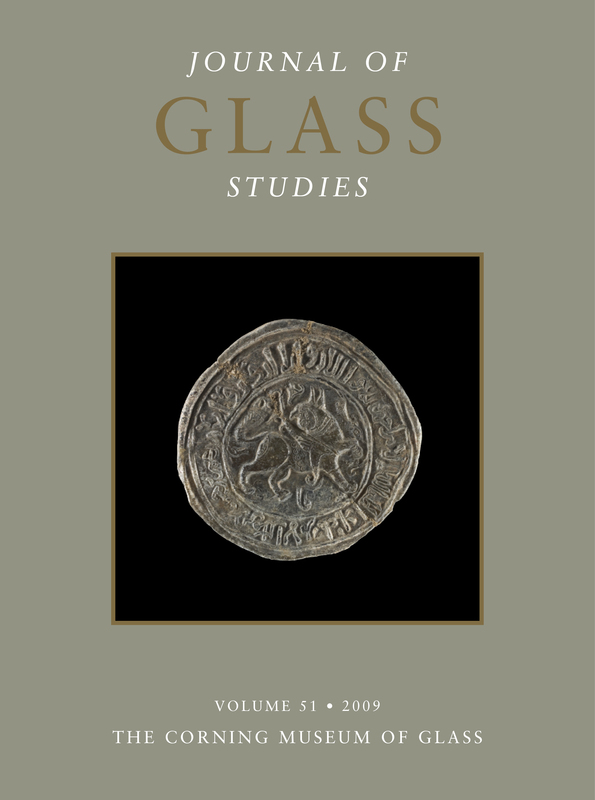 The article discusses the dish in detail and analyzes its significance as a document both for the history of the Order of St. John and for the history of Venetian glass during the Renaissance. The second half of the 15th century, following the invention of crystal, was a very bright period for glass decoration in Venice. On the island of Murano, gilded and enameled glasses were made throughout the 16th century, and diamond-point engraved glasses were produced from about 1535. Some decorators took their craft abroad, particularly to Hall in Tyrol and to Flanders. The 1578 inventory of a Muranese factory includes several cylindrical glasses enameled with heraldic symbols, some gilded objects, and basins and small baskets with figures that were probably cold-worked. Also reported in the inventory are some small pictures with figures made by cold painting, a technique that was popular in the second half of the 16th century. While many studies have been published on North American glass beads, there have been few reports on European glass beads dating from the 16th to 18th centuries. As a result, there is little reliable information about the organization of the glass bead industry and the trading of beads in Europe. This article focuses on the production of small glass ornaments in France. It includes compositional analyses, based on laser ablation–inductively coupled plasma–mass spectrometry (LA-ICP-MS), of 23 glass artifacts found in Rouen, consisting of waste from a small 17th-century workshop that produced glass beads and ornaments such as finger rings, chain rings, and buttons. The results are compared with data obtained on contemporaneous glass beads and glass waste found in the Netherlands. The compositions of the Rouen glass ornaments and most of the Dutch material are extremely close, revealing that a similar recipe was used in both locations. However, different coloring recipes were identified, notably for the red glass. A limited number of conclusions can be drawn because of the small number of elements available for the Dutch material and because of a lack of data for other parts of Europe. However, the study shows that additional research on European material is warranted, and that it should include trace elements and coloring ingredients so as to track more effectively the various types of glass that circulated in Europe and beyond. One of the most important developments in post-medieval tableware manufacturing was the colorless lead-based glass that appeared in northwestern Europe in the late 17th century. George Ravenscroft is traditionally credited with this invention, but the patent he was awarded in 1674 provides no details about the ingredients used. This article reports the results of the chemical analysis of 60 samples of tableware and working waste from the last four decades of the 17th century. The results show that there was a period of experimentation in the 1670s and 1680s before a successful potassium-lead-silica glass was developed. The analyzed samples include four vessels traditionally attributed to Ravenscroft (raven’s head seals), of which only two are lead glasses; the others are alkali glasses. None of the glass compositions are closely correlated with the written accounts of Ravenscroft’s period. Tulichen, a Chinese official and diplomat, was in charge of Sino-Russian relations. In 1720, he learned that Czar Peter I (r. 1682–1725) had sent an ambassador to present a memorial and native products as tribute to the Chinese emperor Kangxi (r. 1662–1722). According to Tulichen’s account (Yiyulu), the gifts presented by the envoy included three pieces of glass: a screen, a table or stand, and a lamp. An unpublished document in the Russian State Archive of Ancient Acts (RGADA) reveals that the emperor reciprocated by sending 82 pieces of glass to the czar, thus adding to sparse documentation for early 18th-century Chinese glass wares. A Mercury bottle marked “CEVHODIA” was discovered in Arles, along the Rhone, in the 18th century. This object, which soon disappeared, is best known from the Montfaucon engraving, but many other representations were made. Six of these illustrations, created by six scholars who had never seen the bottle itself, are presented in this article. Several differences in the drawings are noted. For example, B. de Montfaucon represented the fragmentary object as complete, and E. Calvet even specified its height. The interpretation of the central emblem, an animal, varies from one illustration to another. The mark, as well as an inscribed stone that was also discovered in Arles, was studied by local scholars because both inscriptions consisted of the letters “DIA.” These studies resulted in such confusion that the two discoveries were finally mixed up. Between 1751 and 1765, Denis Diderot and Jean Le Rond d’Alembert published their Encyclopédie, in which they included hundreds of engraved images depicting and visually explaining artistic crafts and common trades in preindustrial France. Despite the interest scholars have displayed in the texts of the Encyclopédie—and in Diderot’s writing on art in particular—the plates and their visual representation of the described crafts have received little attention. This article considers Diderot’s career as both encyclopedist and art critic, and it examines the plates with his enlightened philosophical principles in mind in order to analyze how his art criticism, his biased evaluation of fine artists and their paintings, and his criticism of unrealistic history painting relate to his own commissioning of didactic art. Depictions of glassmaking are discussed and compared with those of similar large-scale manufactures, such as tapestry weaving, which promoted and glorified domestic production. It is widely acknowledged that Louis C. Tiffany was innovative in making and using flat and pressed glass. It is, in fact, the distinctive character of this glass that accounts, in large measure, for the success of his windows, lamps, and mosaics. Tiffany utilized many different types of glass in a rich array of luminous colors and a variety of patterns and textures. However, little is known about the origin, history, and use of this material. It is not clear, for example, what types of glass Tiffany made at his furnaces in Corona, New York. Tiffany also used commercially available glass, but who were his suppliers, what types of glass were purchased, and in what quantities? Drawing on information discovered in the Neustadt Collection’s vast glass archive, the Arthur John Nash and Leslie Hayden Nash Archives in the Rakow Research Library of The Corning Museum of Glass, and other historical documents, this article addresses some of these questions in order to provide a better understanding of the glass on which Tiffany’s critical and commercial success was based. This article concludes a survey of the Smithsonian Institution’s practice of acquiring American glass collections directly from manufacturers between 1886 and 1929. It addresses the years 1917–1929, when important collections of glass arrived from T.G. Hawkes and Company and Steuben Glass Works, both of which were located in Corning, New York. The article also traces the waning emphasis on collecting, particularly because of the onset of World War I, which greatly reduced the amount of staff time in the Division of Mineral Technology that could be devoted to such a pursuit. Frederick Wilson (1858–1932) was one of the most prolific designers of ecclesiastical stained glass in America in the late 19th and early 20th centuries, creating designs that were translated into hundreds of church windows. He was educated in England, and he immigrated to the United States in 1892. While he spent three decades producing designs for Louis Comfort Tiffany (1848–1933), he also worked for at least five other firms that produced stained glass windows. In the early 1920s, he moved to Los Angeles, where he spent the final decade of his career in the employment of The Judson Studios, designing primarily Gothic revival–style windows. Wilson was recognized during his lifetime as one of the most exceptional window designers of his day, and many of his window designs can still be seen today in churches across the United States.